Earlier this evening I arrived in Bucharest. I came by bus and, after the 24-hour journey from Prague, my bum was suitably numb. I made the journey from Prague to Bucharest with Flixbus and the route was not as direct as I expected. Although I thought the bus would go through Slovakia and Hungary then cross the border into Romania, I was wrong. It actually went through Austria and Hungary and then crossed the border near the Romania town of Arad. A Romanian policeman entered the bus at the border and took away everyone’s passports. The driver brought them back around 15 minutes later and began dishing them out. That’s the first time I’ve had my passport taken away like that. I found it a little worrying. Three years ago, when I travelled with Megabus from Barcelona to Amsterdam, French customs officers stopped the bus and checked everyone’s passports. Then everyone had to get off the bus, but nobody took anyone’s passports away. The first Romanian towns I saw were pretty depressing to look at. They looked, old, tired, and rundown. It made me wonder if I’d made a bad choice when choosing a country to live in for the next four weeks. I needn’t have worried. I snoozed for a while and when I woke up I was in a different world. The bus was passing through a very pleasant looking city. 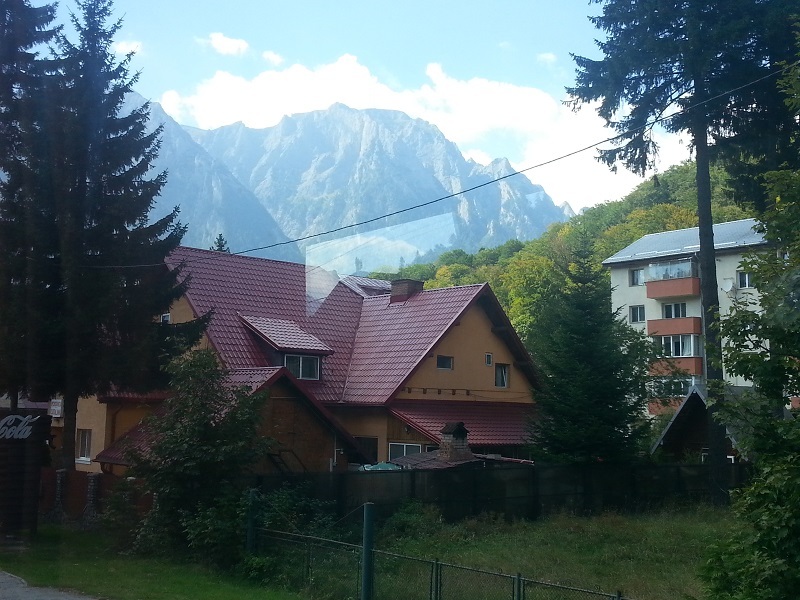 Several hours later, while passing through Transylvania, the scenery was nothing short of fantastic and I saw some incredibly nice houses nestled among the trees. Romania is a very beautiful country. My FlixBus journey from Prague to Bucharest took me through Brasov and, at one point I saw a signpost for Bran. That’s the place that’s meant to be home to Dracula’s castle, but it’s just a story for tourists. Bran Castle has no credible connection to the man who was said to have been the inspiration for Bram Stoker’s Dracula—Vlad the Impaler. Despite the fact that the Dracula connection is built on flimsy evidence, I would like to visit Bran Castle at some point in the future. I don’t want to make the journey during my present visit to Romania. It’s a bit of trek. I’d have to make a 150-minute train journey from Bucharest to Brasov. Then I would probably need to book a room for the night. 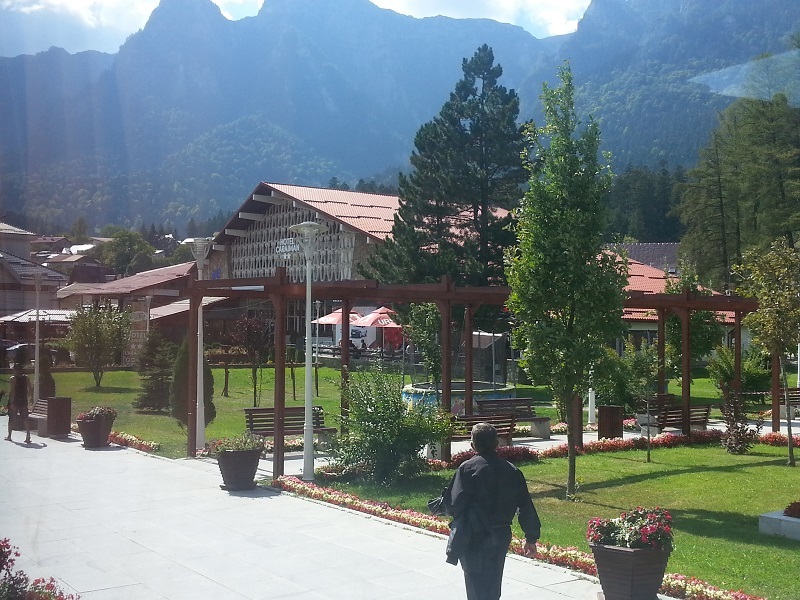 There is only one bus from Brasov to Bran each day and only one bus back. One a future visit I’ll probably spend a month in Brasov and make the trip to Bran Castle while I am there. Despite the fact that 24 of sitting on a bus is murder on the bum and can take its toll on the neck and the back, my journey from Prague to Bucharest was one of my better FlixBus expriences. The bus I was travelling on seemed pretty new. The engine was extremely quiet and the suspension was so good the ride was very smooth. That’s not generally the case with older busses. I’ve travelled on plenty of those so I know that from experience. The Wi-Fi on the bus was also incredibly good. I’ve had problems connecting to the FlixBus Wi-Fi on some of the company’s other busses and, even when I’ve successfully made the connection streaming a video has been difficult. There’s a Dutch soap I like to watch. It’s called Goede Tijden, Slechte Tijden (GTST). I didn’t want to miss the Thursday night episode so earlier this afternoon I powered up my laptop, visited the GTST website and tried to stream the episode. It worked like a charm. There was no disruption or any buffering problems. I watched the episode all the way through without any problems at all. So, how much did my Flixbus journey from Prague to Bucharest cost? I paid €45.99. I’m not going to complain about that. It was a bargain. Flying would have been quicker. It would also have been kinder to my bottom, but it would have cost me considerably more and all I would have seen were some clouds. If possible I prefer to by bus or train because it gives me the opportunity to enjoy the scenery. When I travel it’s not just about getting from A to B, I like the journey to be an experience as well. Hi! I found your blog while Googling “Prague to Bucharest Flix Bus.” I was curious as to what my route was when I also took this 24 hour ride last November/December. I have to say that I am more than sure I went through Slovakia, then Hungary and on through to Romania. Maybe the route changed or changes? It was one of the craziest rides of my life, and I definitely wanted the 24 hours to pass faster. I hope that you are having a wonderful trip! Hi Christina. Thanks for taking the time to comment. It’s possible the route had changed, but FlixBus have more than one bus doing that journey each day. It may be that one bus takes one route and the other one takes another. I think 24-hours is as long as I can take on a bus. It’s nice to see the scenery, but it’s not good to be cramped in a seat for so long.